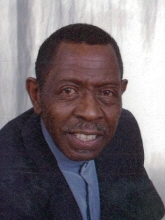 Jimmy Lee Fletcher Sr., 79, passed away at his home in Decatur, IL on Tuesday, February 5, 2019. He was born October 15, 1939 in Memphis, TN, to Robert Fletcher and Elizabeth Allen-Brooks. Jimmy married Bettie “Jean” Howard in 1961, and they moved to Decatur, IL shortly thereafter. She preceded him in death, where they are now rejoined. Jimmy spent a majority of his career as a mechanic with Bob Brady Dodge in Decatur, IL, though his passion for cars began much earlier. He was the neighborhood and family mechanic. Often, he could be found outside working on cars or in his garden. A true southern man, he loved sitting on his porch, fishing, walking the neighborhood, and talking with neighbors. In retirement, he kept busy chasing after his great-grandchildren, who he loved dearly. Surviving are his sons Jimmy Fletcher Jr. of Bolivar, TN, Randall Fletcher of Decatur, IL, Lorenzo McKinnie of Chicago, IL and his daughter, Linda (Darnell) Blake of Middleton, TN; grandchildren Jeanelle (Jonathon) Keck of Decatur and Quamaine Fletcher of Whiteville, TN; great-grandchildren Jami, Jordyn, and Joshua Keck of Decatur, brother-in-laws Augustus Howard of Bolivar, TN and Willie Joe (Lucille) Howard of Decatur; sister-in-laws Juliaette (James) Holt of Memphis, TN and Joanne (Leon) White of Bolivar, TN and a host of relatives and friends. He was preceded in death by his loving wife Bettie Jean Fletcher, parents Robert and Elizabeth, step-mother Annie Fletcher, brothers Franklin Cannon, John Fletcher, Robert Fletcher, Buddy Fletcher, Eugene Fletcher, and Leslie Howard. To send flowers or a remembrance gift to the family of Jimmy L Fletcher, please visit our Tribute Store. "Email Address" would like to share the life celebration of Jimmy L Fletcher. Click on the "link" to go to share a favorite memory or leave a condolence message for the family.